Full set of Gotoh SD91-MGT locking keys. Vintage style and 6-in-line with lock knob on the back. 15:1 ratio. Includes all bushings and screws. 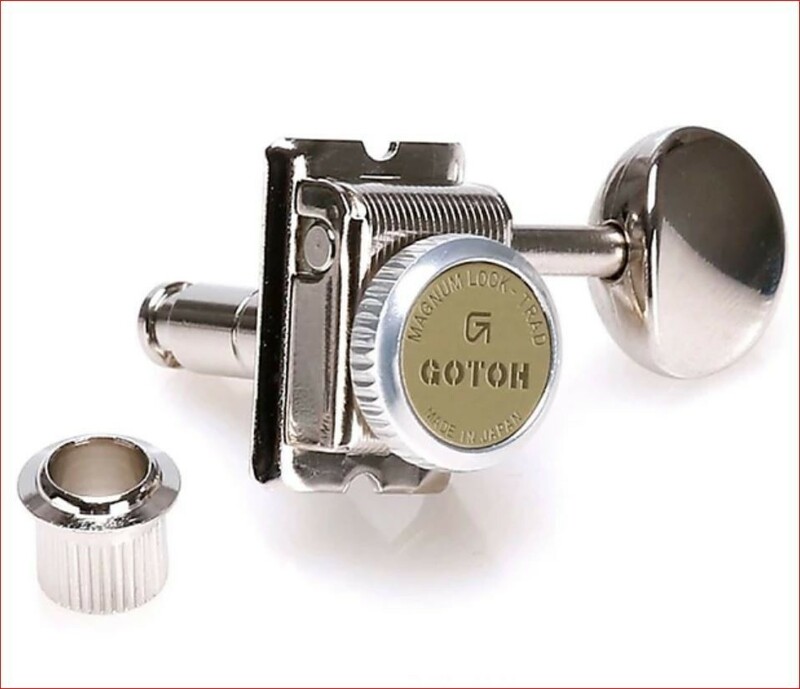 Gotoh guitar and bass parts are some of the highest quality components available and are an excellent choice for any new guitar or replacement. They fit 8.8mm (11/32") vintage peg holes. They DO NOT fit Fenders with the modern 10mm (25/64") Tuner holes which use the hexagonal threaded bushing. These tuners utilize Magnum Lock Traditional, a string locking system which locks the string in place by turning a thumb-wheel at the rear of the tuner. This makes for quicker string replacement. *NOTE: This set does NOT come with Original Packaging They were in our Display Box and Original Box can no longer be located. They are BRAND NEW 100% never used.